The Deadly Duo arrives to foil a bank robbery that is being committed by a group of well-dressed businessmen who all seem to be in a daze. Kill-Cat instructs his partner to move when he tells him to before leaping into battle. He single-handedly takes down the failed thieves before berating the Kid Avenger for providing him with no assistance. The Kid Avenger points out that the never received an order for him to join the fray. Sometime later, Alan Williamson takes Mark Osborn into his offices where he shows him around his business. Mark is introduced to Alan’s executive secretary Lotta Topp and it is obvious that they find one another attractive. Mark checks to make sure that there is nothing going on between Alan and Lotta as he has been given Lotta’s phone number and asked to take her to dinner. Mark wonders how his partner became Kill-Cat and is told a long origin story by Alan which begins when he was seventeen. He had accompanied his parents on a safari and they were joined by his father’s business partner, Biff Brown. Walter and Wilma were killed when they stepped on a boobytrap and Alan blamed Biff for their deaths, suspecting that he organized their murder so that he could lay claim to their fortune and business. Biff protests his innocence but is forced to defend himself against the teenager, accidentally knocking him into another trap that mortally wounds him. Alan survived this ordeal thanks to a local tribe who performed crude surgery, replacing many of his organs with that of a panther. They also utilized potions and witchcraft that granted Alan superhuman abilities. He eventually returned home to inherit his family fortune and is welcomed back by Biff who is still seen as guilty of murder in Alan’s eyes. He takes on the guise of Kill-Cat and systematically destroys Biff’s life, eventually driving him to suicide. The Kid Avenger points out that at no point did Biff admit his guilt and Kill-Cat may have driven an innocent man to his death. While Mark goes on his date with Lotta, Alan is taken by an associate to meet some women but discovers that the females in question are actually prostitutes from the undersea kingdom of Atlantis. Their addictive nature allows the woman who abducted them to gain money from her clients but also uses these helpless men for food. 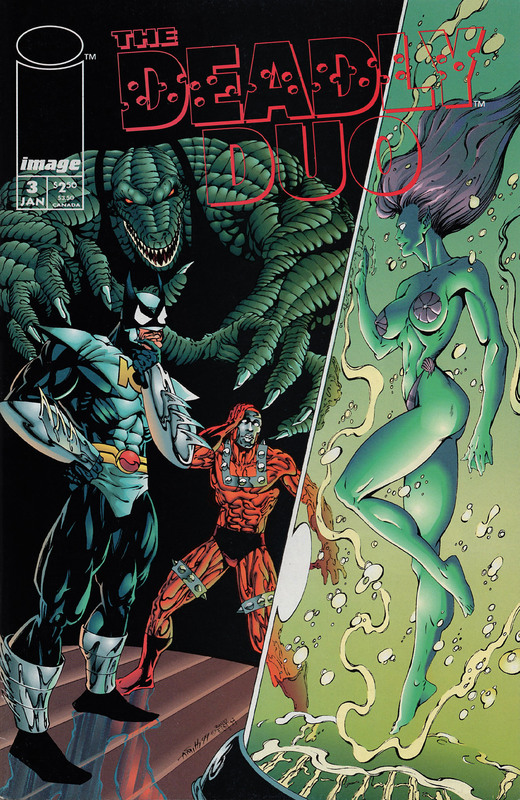 ManEater is assisted by Gator and when Alan runs off to don his costume, Kill-Cat is left outgunned against these two villains. Roman had been tracking the Hookers from Atlantis as their safe recovery is the only thing keeping his native Neuport from being driven into war with Atlantis. He catches up with the villains at the same time as the Kid Avenger comes to Kill-Cat’s aid. The Kid Avenger fires a blast that ricochets off of Roman and shatters the tank containing the prostitutes, showering shards into ManEater’s throat. Gator is forced to surrender so that his partner can receive medical attention. Roman thanks the Deadly Duo for their assistance before leaving with the Hookers from Atlantis. Kill-Cat is enraged that the Kid Avenger did nothing to really help him and his junior partner wishes that he had stayed to finish his date.